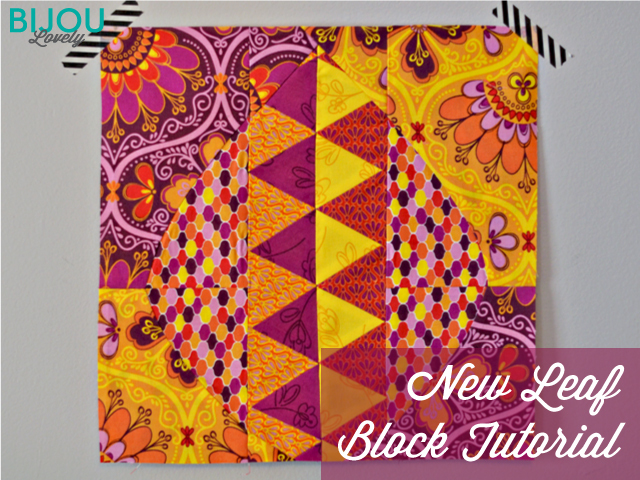 Bijou Lovely: New Leaf Bee Block Blog Hop & Block Tutorial. 13 New Leaf Bee Block Blog Hop & Block Tutorial. 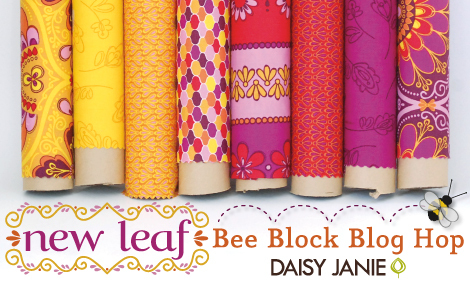 I am thrilled to be a part of Daisy Janie's Bee Block Blog Hop today, showing off her newest collection, New Leaf. It's a gorgeous collection made of 100% GOTS certified organic cotton. The colors in this line are really beautiful, saturated jewel tones. I really love the purples! It's hard to find good purple fabric! 1. Download the templates. You can find them here. Print two copies of Templates A1, A2, B1, and B2, and one of Templates C1 and C2. Make sure to print at 100% scale if you want a 12.5" unfinished block! Cut out the templates, lay them out and mark which color fabrics go in each spot if you're alternating the background fabric like I did. Set the extra set of templates for A1 - B2 aside after labeling them. These will be your cutting templates in Step 5. 2. 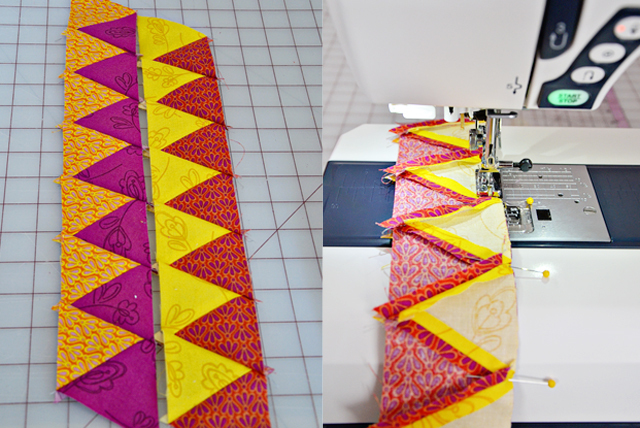 Piece your center strip of triangles. I used 2.5" 60 degree triangles, cut with a Hex N More Ruler. If you do this, you'll need 28 triangles to fill the middle of the leaf. 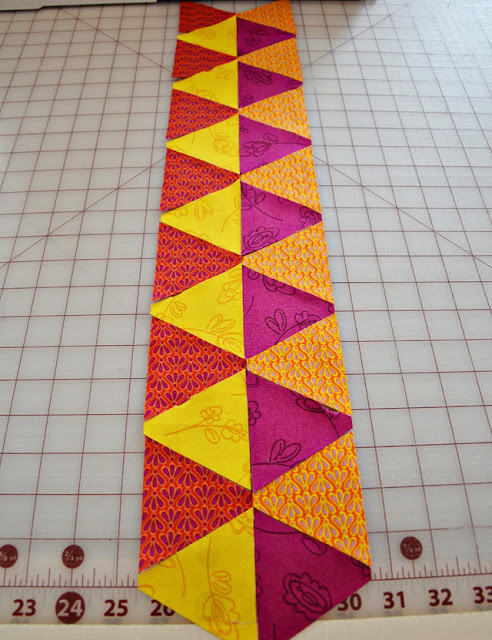 Lay out your triangles the way you want them to look in your block and stitch them together with a 1/4" seam allowance. You'll need to piece two rows to do this, then sew the two rows together. 3. 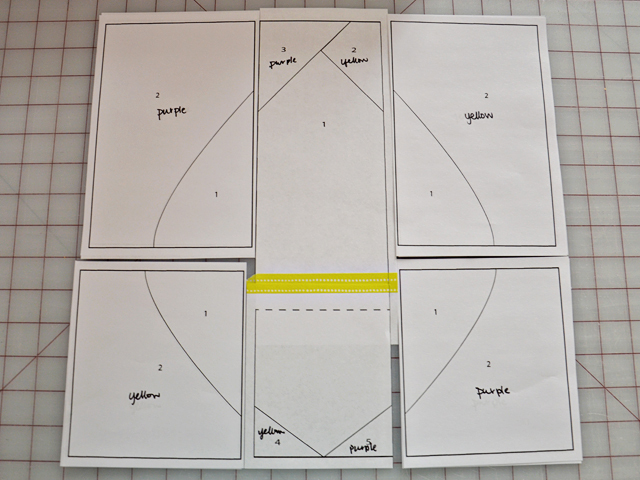 Next we'll piece the inner curves of our leaf block (labeled #1 in templates A1 - B2. 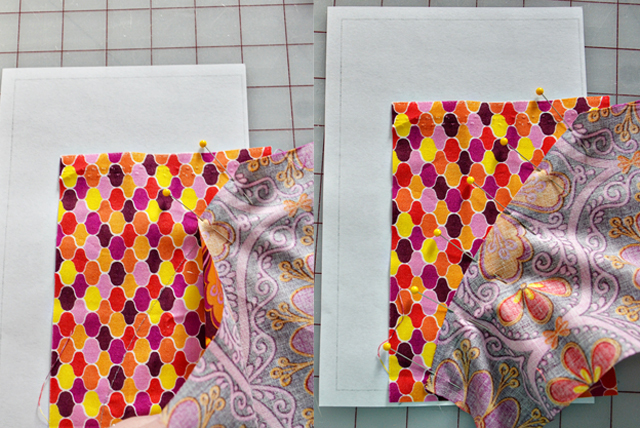 Cut two pieces of fabric for A1 and A2 that are at least 6" x 5-1/2". Cut two pieces for B1 and B2 that are at least 5" x 5-1/2". For each template, place the fabric with the right side facing away from the back of the paper template, filling in the #1 spot. 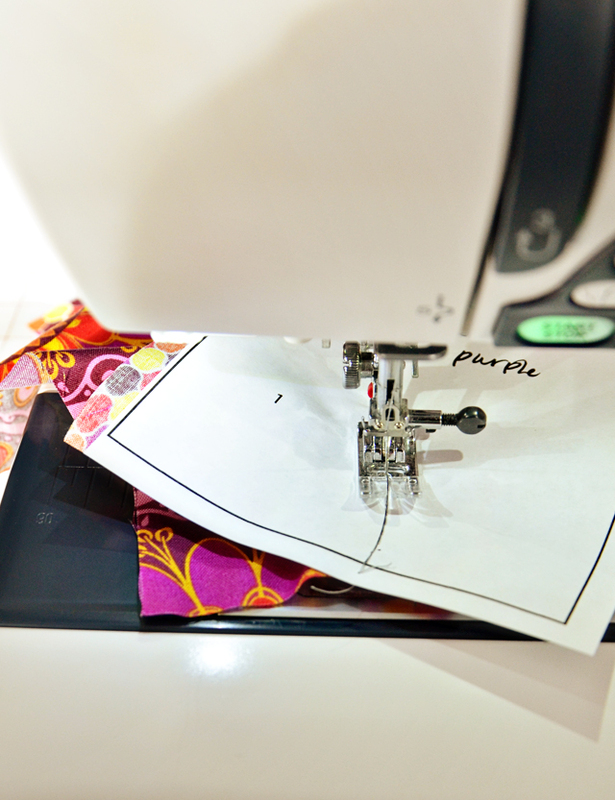 Hold it up to the light to make sure you have at least 1/4" seam allowance along the curve and the edges. 4. Now we're going to baste along the curve. 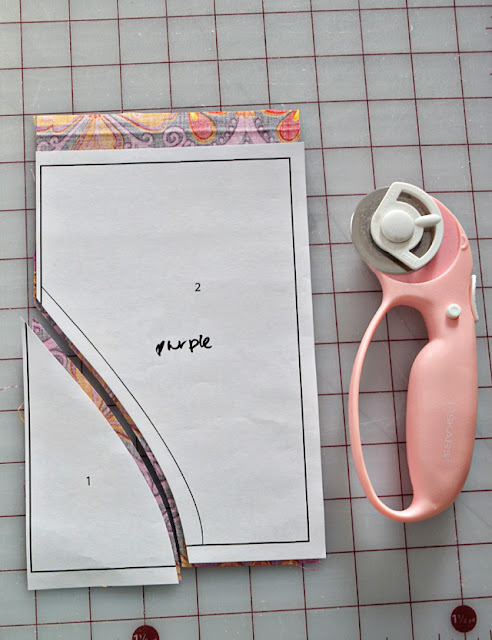 This will accomplish two things: it will keep your fabric in place while we sew the next fabric on, and it will serve as a marker for your seam allowance when we pin the next fabric to the template. Make sure to use a large stitch length for this part. Repeat this process for templates A1, A2, B1 and B2. 5. Now we're going to cut our fabric for the #2 sections. 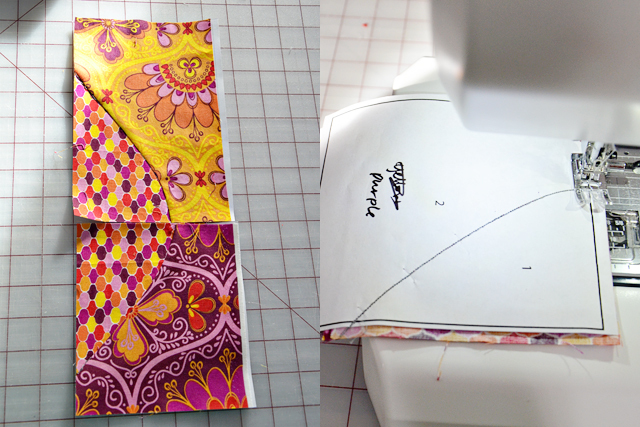 Cut two pieces of fabric that are at least 6" x 8-1/2" for A1 and A2. Cut two pieces of fabric that are at least 6" x 6-1/2 for B1 and B2. Take your extra templates for A1 - B2 that we had set aside in Step 1 and lay your fabrics behind them with the right side of the fabric facing away from the back of the paper. Cut along the side labeled #1, about 1/4" away from the curve, as shown. Repeat for templates A1 - B2. 6. 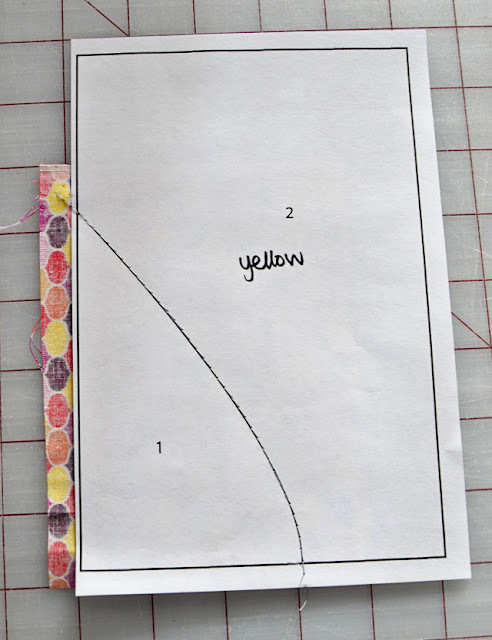 Pin your fabric around the curve of your sewing templates (the ones with fabric already basted to #1). You'll want to pin the fabric with about a 1/4" overhang on top of the line you had stitched through the paper to your #1 fabric, as shown. Note you are covering up the stitched line as you pin! 7. Sew along the curve to attach the fabric. Go slow and be mindful of puckers as you go. I leave the pins in and slowly sew over them so the needle can go around them. 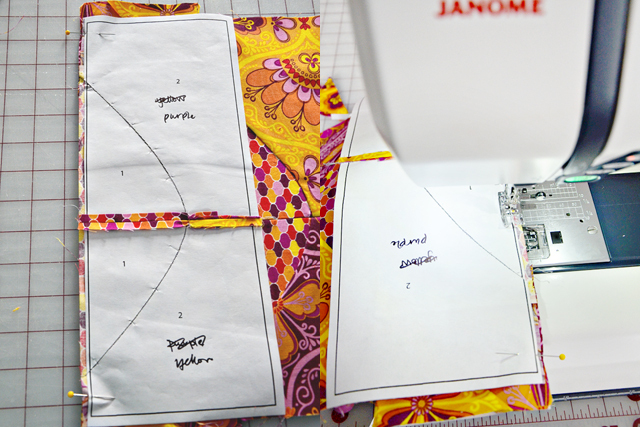 Press the fabric to set the curve and trim your templates down to size by cutting along the dashed line. Repeat for A1 - B2. 8. 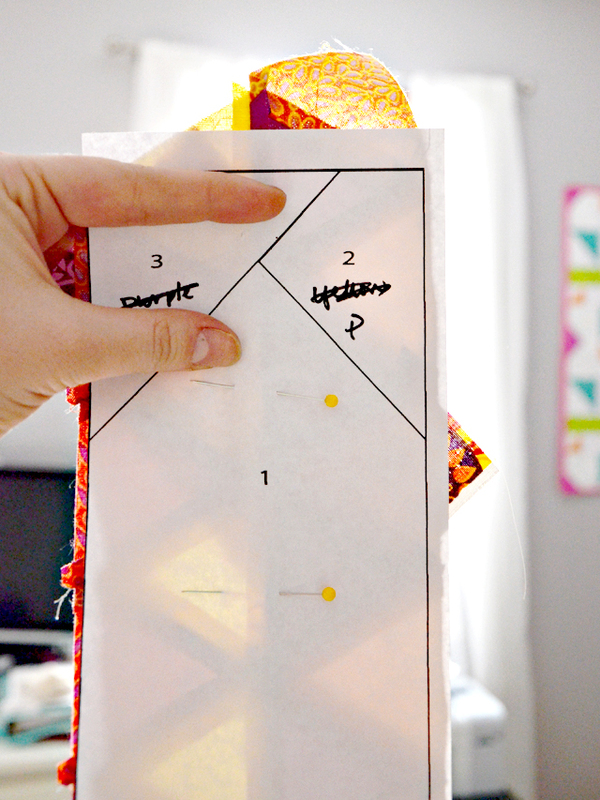 Pin your pieced triangles to the back of the C template with the right side facing away from the paper. You can baste it in place if that's easier too. 9. 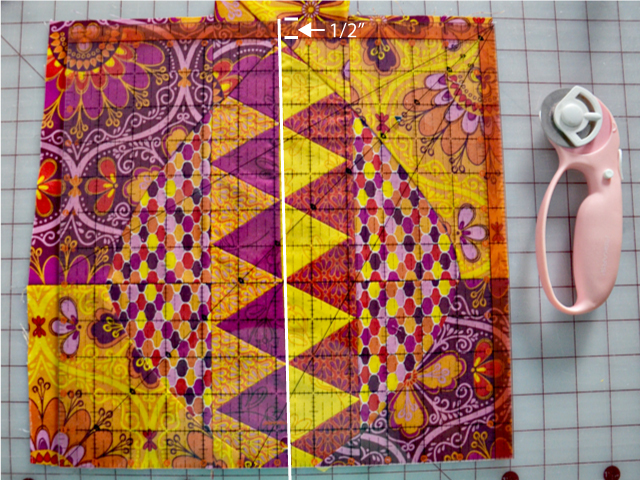 Continue using normal paper piecing technique to add fabrics 2 - 5 to the template. 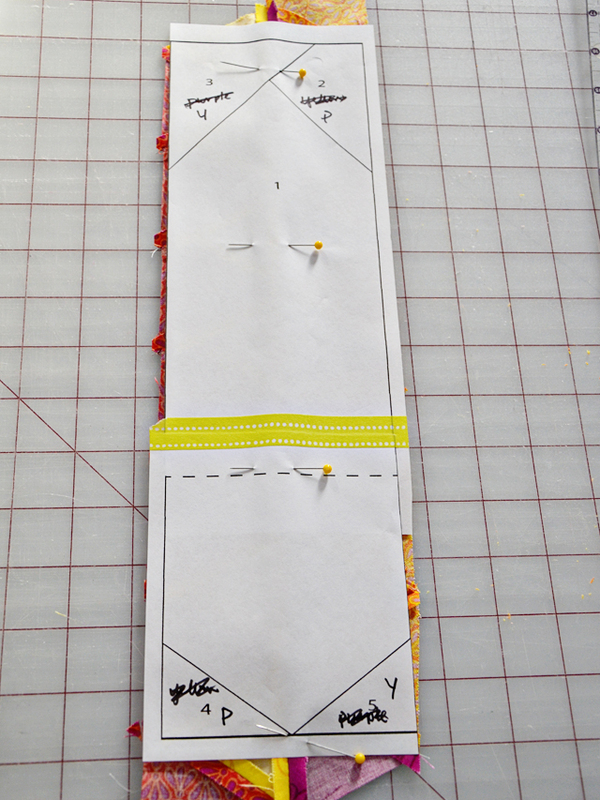 Trim up the block by cutting along the dashed line when finished piecing the template. 10. Match up the Side A Top and Side and Bottom pieces, and pin them right sides together along the center seam. Stitch together along the solid line. Press seam open. Repeat for Side B Top and Side B Bottom pieces. 11. Pin the Side A templates to Template C, with the fabrics facing right sides together and the bottoms of Side A and Template C aligned (there will be a little overhang on template C on the top, that's okay, we'll trim it off later. Sew along the solid line to connect the blocks. Attach Side B templates to Template C in the same manner. Press seams open. 12. Trim your block to 12.5", with the center of the triangles centered within the block and 1/2" excess along the tip of the leaf. 13. Admire your pretty leaf block! I hope you enjoyed this tutorial! Thanks so much Jan for letting me play with your pretty fabric! 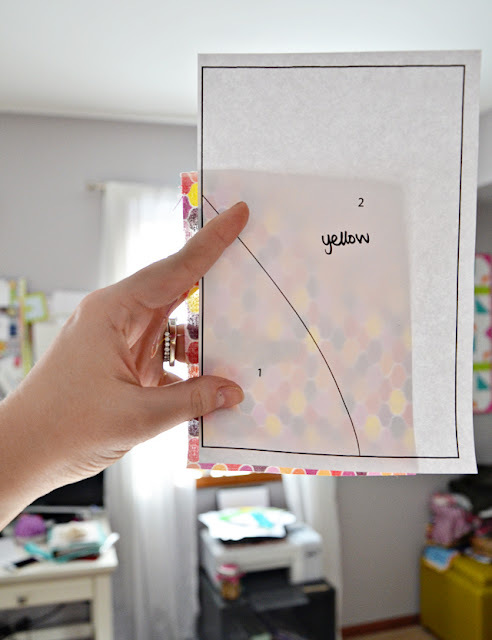 Make sure to check out the other stops along the blog hop. If you're participating in the Fat Quarter Word Scramble, my secret letter is I! This is a lovely block! 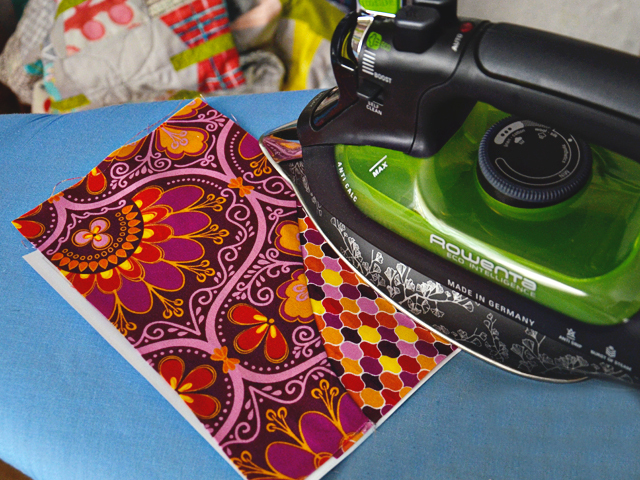 You made AMAZING use of those gorgeous fabrics! Great job. Wow! 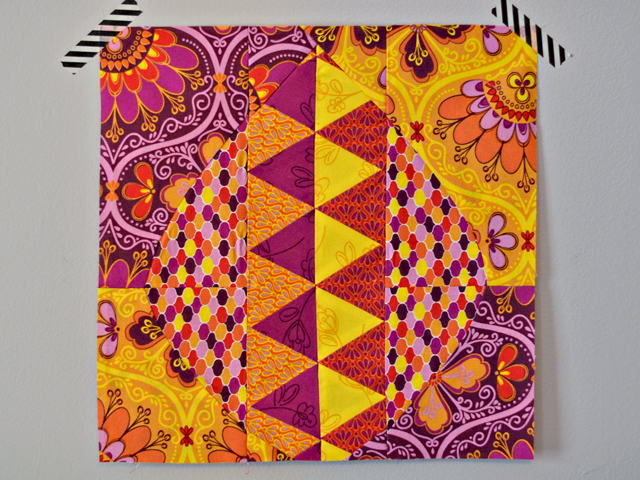 Amazing paper piecing! What a perfect interpretation of the bee block challenge! Thanks for the template Holly! The triangles are awesome! I like how subtle the leaf is in these prints. Your points are perfect.... your block is amazing!! It`s very nice and love these stunning fabrics.Have a fun weekend!! Thanks for a great tutorial. Your block is lovely. What an innovative block. 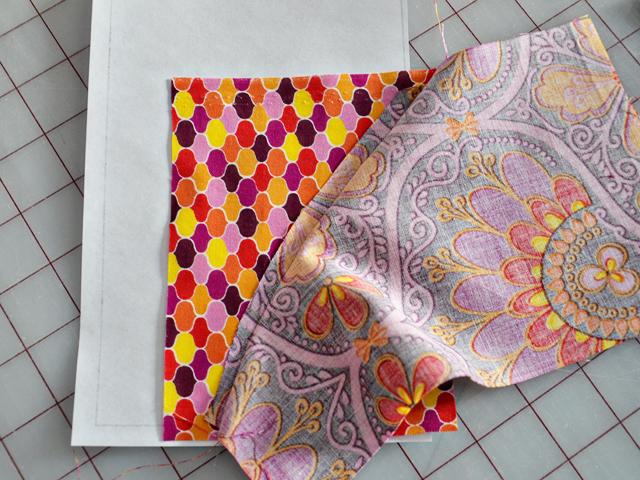 It's just beautiful--and fun to see what everyone is creating with this fabric. I just love the colors! A seriously fabulous block, Holly! Well done!! I will definitely give this one a try soon! awesome block holly! love it! What a creative block and thank you for showing us how to do that! sweet block - thanks so much for the tutorial !